"Another Great Day of Diving"
To learn more about the Project, please click on the link below. If you have any questions or comments about the above project, please contact the project leader by clicking on the link Above. This is a continuation of the GLSPS Board of Directors desire to encourage members that haven’t participated for a while, or not at all, to participate and meet other members. To that end, we had brand new member Vinnie Cobbs on board. Vinnie celebrated his 50th Open Water dive on our second dive on the Hesper, that Sunday. We did 2 dives on the Madeira on Saturday. The big Lake had building waves, so the ride was a bit bouncy. Ken and Jim were trying to capture some video for new 3D film software Ken is experimenting with. Visibility was fine for diving, but, not quite what Ken wanted for this. On Sunday, we made a quick trip out and around the Silver Bay Marina breakwater to the wreck of the Hesper. We did 2 dives here. Ken looked to get video here, as well, but, the waves had the visibility stirred up too much to even attempt video. Breakfast and lunch both days on board kept our crew fueled. With a nice relaxing supper in town Saturday night, the crew was happy, as well. Divers on Surface Interval and Enjoying the "Fun Dive"
6:00 PM – Dive the Hesper from shore, if enough interested divers. 7:00 AM - Wake up call, begin breakfast. Please Note: All participants need to meet at the dock at Silver Bay Marina and be loaded by 8:00 AM Saturday. 8:00 - Group “Before” photo. All waiver forms need to be signed at this time. Perform boat safety briefing. 8:30 AM - Cruise South to the Madeira. Tie up on stern buoy. 9:00 - Dive Safety briefing (15 min). Establish dive teams and order. Set up and drop surface supplied O2 system on descent/accent line (anchor line). 9:30 AM - First dive team down. 10:30 AM - Start filling scuba tanks for first dive team. 11:00 AM - Start second team air filling. 1:00 PM - Send first team down for their second dive. 1:30 PM - Send second dive team down for their second dive. 2:00 PM – First team returns, start filling tanks. 2:30 PM – Second team returns. 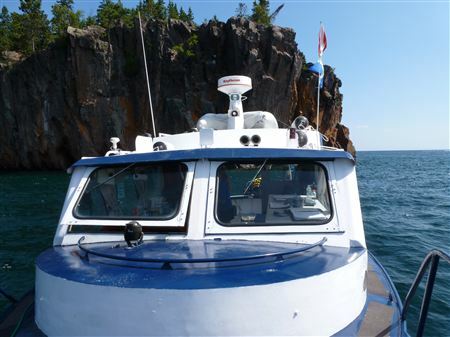 Discuss a possible 3rd dive, in boulders under the lighthouse. 5:00 – 7:00 PM - Return to dock at the Silver Bay Marina, filling tanks on the way. Discuss dive(s) for Sunday. 7:00 PM – Supper. Local dining of the group’s choice. 10:00 PM - Lights out. 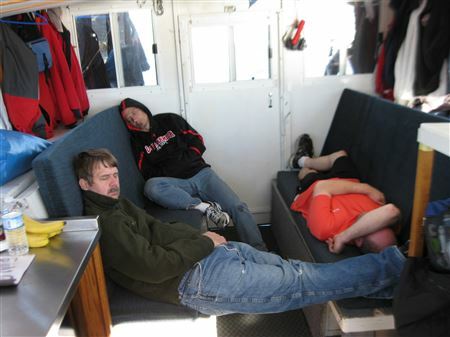 (Required sleep for divers and crew). 7:00 AM - Wake up call. 8:00 AM - Depart from dock for Hesper and start breakfast. 8:30 AM – Breakfast and safety briefing for the day. 9:00 AM – First dive team down. 9:30 AM – Second dive team down. 10:00 AM - First dive team returns. 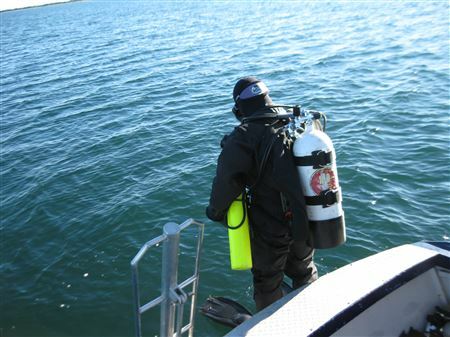 Begin filling tanks for a second dive (if). 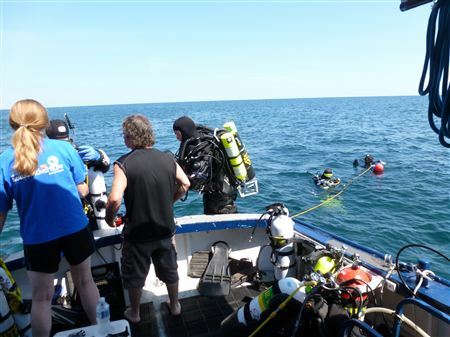 10:30 AM – Second dive team returns. 12:00 Noon - Lunch is served. Finish filling tanks for second dive. 1:00 PM - If second dive has been approved, start second dive after short briefing. 1:30 PM - If there is not a second dive to perform, wrap up diving operations and head back to the Marina to unpack and head for home. 2:30 PM - Second dive team down. (If there is a second dive). 3:30 PM - Diving operations end, wrap up and head back to Marina for unloading and debriefing on the project. (This takes place typically on the way back to the Marina). 4:30 PM - Return to dock at Silver Bay Marina. 5:00 PM - Clean boat, group “After” photo. Thank you to all that participated in this project. We hope you had fun learning about GLSPS Projects and procedures. Hopefully, you will be able to participate in a future GLSPS Project. Watch for the report and pictures of this project in the "2014 Projects Report" page on the GLSPS website soon after the project. The GLSPS decided to have some “fun” events, events that don’t have a particular project. These events are to get members that haven’t participated or been on the R/V Preservation, to do so, or to participate in a more involved role. Without a specific project to complete, the emphasis is on getting to know other members and diving. The boat was docked at Silver Bay Marina. We planned to dive the wrecks of the Madeira and the Hesper and, possibly, some shoreline features. Weather permitting, of course. Some of us were hoping to dive the Hesper Friday evening, but, ran out of time by the time we all arrived and got the boat ready. Building waves were forecast for Saturday, so we got up early and headed to the Madeira. We all got one dive in and decided to head back to the dock before the waves made traveling too uncomfortable. We did some inspecting of a large piece of steel inside the stern section that is rather loose. It will need some attention, either to secure it to the wreck or bring it down. The afternoon was spent relaxing on the boat and talking with other divers and boaters at the marina. Fellow members Steve Daniel and Jay Hanson joined us for the evening. After supper at a local establishment, Jay and his family treated us to a campfire on shore at the marina. Sunday saw high waves, again. We motored out and around the marina’s break water to the calm waters above the Hesper. Not everyone chose to dive, but, those that did got one dive in. After the diving, Tim drove the Preservation on a “tourist trip” to see an ore carrier up close. The ship came in to port while we were diving. We had several “first timers” on board and a first time event leader. Even though the weather didn’t quite cooperate, the camaraderie and amenities on board the R/V Preservation were excellent. As a first time leader, I enjoyed getting to know the GLSPS procedures better. My pancakes might need some improvement, however. If my pancakes can be overlooked, I plan on volunteering to lead some more events. 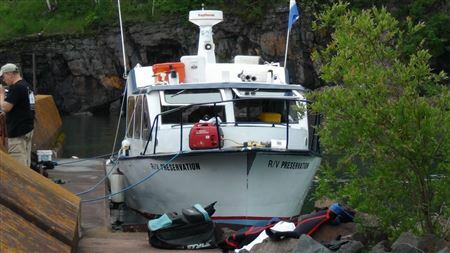 Please join us next year (2015) for the GLSPS Fun Dives off the RV Preservation along the North Shore. We hope to see some new faces joining us. If you still have any questions, please contact Bob with any of his contact information on the event page. The above Project was canceled because of the lack of interest. 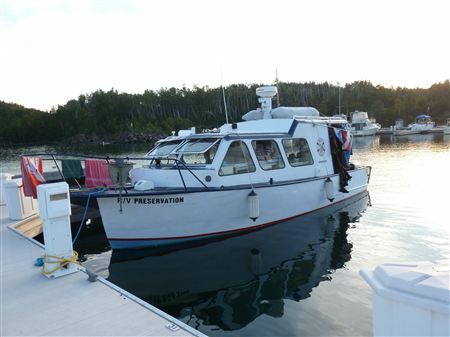 If members would like to join us on any fun dives off of the RV Preservation, please register in advance or when they become available so the dive doesn't get canceled like the above fun dive. It's hard to believe members (and their dive buddies wouldn't jump at the chance to dive off a boat along the North Shore for next to free, (except for the gas expense driving up the North Shore).